Auto Body Concepts, of Ardmore, Oklahoma, and Gainesville, Texas, is a full-service auto collision repair center. We now have two great locations to serve you. Have your car back in the fastest time possible. We currently work with all major insurance companies under their direct repair programs. For smaller jobs, we average a 24-hour cycle time. We are known as the fastest shop with the best quality in this area. In our Gainesville shop, we employ a staff of highly skilled tradespeople. 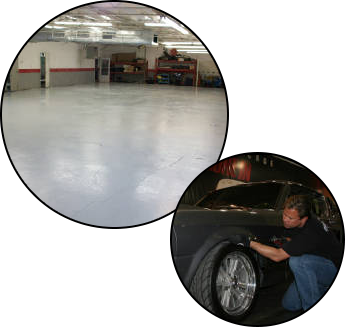 The shop is 35,000 square feet and performs approximately 50 to 60 repairs per week. We have a good and highly productive shop. Our current manager and owner has worked in the collision repair industry most of his life. Starting out in his father's business, along with his two brothers, he uses the knowledge learned from his father, as well as the newest technologies, to hone his skills as a collision repair professional. Our company's owner received the 2001 Emil Stanley Merit Award by the Automotive Management Institute and the Automotive Service Association. Staying abreast of the latest technologies and advancements of the industry is a top priority for Auto Body Concepts Collision Center. Ongoing training is offered to our staff through numerous industry sources including the Inter-Industry Conference on Auto Collision Repair, the International Mobile Air Conditioning Association, and the National Institute for Automotive Service Excellence. We chose to join the Automotive Service Association because we want our customers to know and recognize that we are involved with the best organizations in the industry. By taking advantage of the professional organizations and educational avenues that are available; we are able provide you with the best possible service. In addition to providing quality repairs, the business offers many services to make the collision repair process as worry free as possible. We furnish transportation for you and work around your schedule as much as possible. We take great pride in offering you quality repairs and honest advice to help during a stressful time. We provide free estimates. Call today or drop by one of our locations.